Mental illnesses are common in the United States. It is estimated that 43.7 million adults are affected with mental health, behavioral, or emotional disorder. This number represents 18.29% of all adults in the US, according to Mental Health America. Schizophrenia, bipolar disorder, dysthymic disorder, major depression, and anxiety disorders are examples of conditions that can affect the day-to-day activities of persons living with a mental illness. In the event of an emergency, it is important for mental illness to be known to emergency responders. Wearing a mental health awareness bracelet or medical ID jewelry can let first responders know about a person's mental health condition. Parents of children living with mental illness and adults themselves living with any mental condition have concerns on how to convey their specific needs in times of emergencies. One simple solution is to be wearing a medical ID at all times. This accessory can be worn as a necklace or wristband and contains engraved medical information about the person wearing it. Mental health jewelry allows persons living with mental conditions to live safely and with peace of mind. Medical ID tags for mental illness allows first responders such as emergency personnel, physicians, including law enforcement to recognize the specific needs of a patient living with a mental health condition. A medical ID can speak for the person wearing it and facilitate prompt and precise treatment while also reducing errors based on misdiagnosis. 95% of emergency respondents check for a form of medical identification around the neck and wrist. Wearing a medical ID such as mental health wristbands help medical professionals understand these behavior and avoid them from being misdiagnosed. Engraved information will alert respondents and give them an idea of what’s going on and what type of help or treatment is required. Some patients with mental conditions are also at risk of becoming disoriented and start to wander. 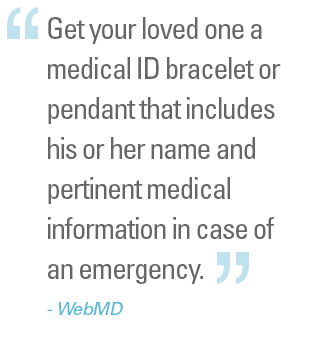 A medical ID can assist in the safe return of loved ones by engraving an in case of emergency (ICE) contact. Prescription drugs or medications can also be engraved into mental health medical ID tags, an important feature to alert medical professionals of significant interactions and risks. Medical IDs for mental health can save lives and allow you or your loved one to live life to the fullest with safety, security, and peace of mind. Choose the right mental health awareness jewelry. Choose American Medical ID.